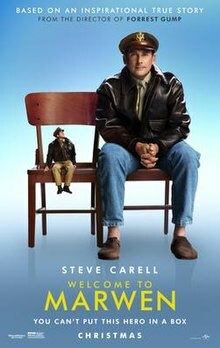 Welcome to Marwen is a 2018 American drama film directed by Robert Zemeckis, who co-wrote the script with Caroline Thompson. It is inspired by Jeff Malmberg's 2010 documentary Marwencol. The film stars Steve Carell, Leslie Mann, Diane Kruger, Merritt Wever, Janelle Monáe, Eiza González, Gwendoline Christie, Leslie Zemeckis, Siobhan Williams and Neil Jackson, and follows the true story of Mark Hogancamp, a man struggling with PTSD who, after being physically assaulted, creates a fictional village to ease his trauma. The film was released in the United States by Universal Pictures on December 21, 2018. Critics lamented the inconsistent tone and screenplay, although the visuals received some praise. The film was also a box office bomb, with projected losses for the studio running as much as $60 million. A World War II warplane piloted by a doll-like figure is hit by enemy fire and forced to ditch. The pilot's shoes are burned in the forced landing and he finds women's shoes, which he wears instead. The pilot is confronted by doll-like German soldiers, who taunt him for wearing women's shoes. The Germans threaten to emasculate him, but are killed by a group of doll-like women who come to the pilot's rescue and protect him. As told in flashback, set in 2000, it’s revealed that the doll-like figures are actually modified Barbie dolls photographed by Mark Hogancamp, who has created a model village named Marwen (later renamed Marwencol) to help him cope with his diagnosis of posttraumatic stress disorder and memory loss from an attack some time earlier by white supremacists after he unwisely and drunkenly told them about his fetish for wearing women's shoes. Mark fantasizes that the dolls are alive and act out in scenes which he photographs. The dolls correspond to people that he knows in real life: himself as "Cap'n Hogie", the pilot; female friends as his protectors; and his attackers as German Nazi soldiers. A green-haired doll named Deja Thoris is the Belgian Witch who prevents Cap'n Hogie from becoming too close with any woman, sending the women far into the future. Deja Thoris herself represents the pills which Mark takes to relieve his pain, to which he has become addicted. Mark has a court date to make a victim impact statement at the sentencing of the men who attacked him. After being initially reluctant to appear in court and confront his attackers, he comes to the hearing but flees when he imagines the defendants becoming German Nazi soldiers and shooting him. The judge reschedules the sentencing hearing for the same day that Mark's photographs will be shown at a public art gallery. Mark falls in love with a woman named Nicol who moves into the house across the street, and buys a doll which he names Nicol to represent her. The doll Nicol is in love with Cap'n Hogie and they get married. In real life, Mark proposes marriage to Nicol, who tells him that she just wants to be his friend. Mark takes this rejection hard and contemplates suicide. Mark imagines Nicol being shot by a Nazi, who in turn is killed by Cap'n Hogie and brought back to life, along with other Nazi soldiers, by Deja Thoris. Cap'n Hogie realizes that Deja Thoris is a Nazi spy, and Mark realizes that the pills that he thought were helping him were actually hurting him. Mark pours the pills down the sink and vows to break his addiction to them. Mark goes to the rescheduled sentencing hearing and delivers an inspiring victim impact statement. That evening Mark attends the exhibition of his photographs and makes a date with his friend Roberta, who is a sales clerk at the hobby store where he is a frequent customer. The film ends with a photograph of the real Mark Hogancamp, who has a successful career as a photographer. Steve Carell as Mark Hogancamp, an aspiring artist who was beaten up by five men for expressing his fetish with women's shoes and creates a miniature village called Marwen (later called Marwencol). Steve Carell also portrays Cap'n Hogie, a pilot and Hogancamp's counterpart in Marwen. Leslie Mann as Nicol, Mark's new neighbor. Diane Kruger as Deja Thoris, the Belgian Witch of the fictional Marwen who is a Nazi spy. Merritt Wever as Roberta, a kind friend of Mark who works at the hobby shop where he buys the models and toy figurines he uses to build Marwen. Janelle Monáe as Julie, a social worker who befriends Mark while in rehab. Eiza González as Carlala, Mark's friend at the bar where he helps out a few times a week. Gwendoline Christie as Anna, Mark's Russian caretaker. Leslie Zemeckis as Suzette, Mark's favorite actress. Neil Jackson as Kurt, Nicol's rough and poorly mannered ex-boyfriend. Falk Hentschel as Hauptsturmführer Ludwig Topf, Deja Thoris's henchman. Ulster County Sheriffs portrayed by Fraser Aitcheson, Trevor Jones, Brad Kelly, Jeff Sanca, and Patrick Sabongui. On April 28, 2017, it was announced that Robert Zemeckis would next direct an untitled drama film that would star Steve Carell. On May 19, 2017, it was announced that Leslie Mann and Janelle Monáe had joined the cast. On May 23, 2017, Eiza González joined the cast. In June 2017, it was reported that Diane Kruger had joined the cast to portray the villain  while Gwendoline Christie also joined the cast. In July 2017, Merritt Wever and Neil Jackson joined the cast of the film. On August 6, 2017, the studio hired a German actor Falk Hentschel to play the role of a villain, as Hauptsturmführer Ludwig Topf, a Nazi captain to a squad of SS Storm Troopers who terrify the people of Belgium. On August 21, 2017, the director's wife, Leslie Zemeckis, was cast in the film for an unspecified role; she plays an actress in a pornographic film that Hogancamp watches. Principal photography on the film began in Vancouver, British Columbia, Canada, on August 14, 2017. The filming was completed around October 19, 2017. In June 2018, the film was officially titled Welcome to Marwen. The film's official soundtrack was scored, composed and conducted by Alan Silvestri. The first trailer was released on June 20, 2018. The film was released in the United States by Universal Pictures on December 21, 2018. The studio spent $60 million on promotion and advertisements for the film. The original plan was to spend $120 million on promoting, but after early test screenings went poorly, the costs were cut. Welcome to Marwen grossed $10.8 million in the United States and Canada, and $2 million in other territories, for a total worldwide gross of $12.8 million, against a production budget of around $39 million. In the United States and Canada, the film was released alongside Aquaman, Second Act and Bumblebee, and was projected to gross $7–9 million from 1,900 theaters over its five-day opening weekend. After making just $909,000 on its first day (including $190,000 from Thursday night previews), three-day weekend estimates were lowered to $3 million. It went on to debut to $2.4 million, finishing ninth and marking the worst opening of Zemeckis' career. It then made $490,000 on Monday and $1.3 million on Christmas Day for an "awful" five-day total gross of $4.1 million. Following its low opening, insiders estimated the film would lose Universal $50–60 million, the second straight week the studio released a film that was a box-office bomb following Mortal Engines. The film made $2.2 million in its second weekend, dropping 5%. On review aggregator Rotten Tomatoes, the film holds an approval rating of 33% based on 149 reviews and an average rating of 4.92/10. The website's critical consensus reads, "Welcome to Marwen has dazzling effects and a sadly compelling story, but the movie's disjointed feel and clumsy screenplay make this invitation easy to decline." On Metacritic, the film has a weighted average score of 40 out of 100, based on 37 critics, indicating "mixed or average reviews". Audiences polled by CinemaScore gave the film an average grade of "B–" on an A+ to F scale, while those at PostTrak gave it a 57% overall positive score and a 37% "definite recommend". Writing for IndieWire, David Ehrlich gave the film a "C" and wrote, "In trying to celebrate the healing powers of art, Zemeckis has created a sometimes fun, often morbidly compelling, and always ill-advised testament to the ways in which those healing powers can create problems of their own." Michael Phillips of the Chicago Tribune gave the film 1.5 out of 4 stars and said, "The way Zemeckis shapes these stop-motion animation scenes, they're meant to be exciting, funny, scary, a little of everything. But they whack the movie completely off-kilter. We lose the strange, quiet intimacy of Hogancamp's careful manipulation of this world. The real-life scenes don’t feel like Hogancamp's real life; they feel like a Hollywood falsification of it, despite Carell's and Mann's valiant efforts." Contrarily, Richard Roeper of The Chicago Sun-Times praised the film, giving it 3.5/4 stars and saying, "Leave it to the innovative and greatly skilled veteran director Robert Zemeckis to deliver a beautiful and endearingly eccentric movie based on the life and the imagination of Mark Hogancamp. And leave it to the chameleon everyman Steve Carell to deliver a subtle, layered, empathetic and memorable portrayal of Mark — both the man and the doll." ^ a b c d "Film releases". Variety Insight. Archived from the original on 2018-09-03. Retrieved 2018-09-03. ^ a b c "Welcome to Marwen (2018)". Box Office Mojo. IMDb. Retrieved January 16, 2019. ^ a b c D'Alessandro, Anthony (December 24, 2018). "Why 'Welcome To Marwen' Was Unwelcome At The Box Office: Robert Zemeckis Pic To Lose Around $60M". Deadline Hollywood. Retrieved December 24, 2018. ^ a b Perez, Lexy (June 20, 2018). "'Welcome to Marwen' Trailer: Steve Carell Stars in Robert Zemeckis' Heroic Drama". The Hollywood Reporter. Retrieved June 20, 2018. ^ McClintock, Pamela (December 23, 2018). "Box Office: 'Welcome to Marwen' Bombs With $2.4M Debut, Will Lose $50M-Plus". The Hollywood Reporter. Retrieved January 4, 2019. ^ N'Duka, Amanda (April 28, 2017). "Untitled Robert Zemeckis Project Starring Steve Carell Eyes Thanksgiving 2018 Release". Deadline. Retrieved April 29, 2017. ^ Kroll, Justin (May 19, 2017). "Leslie Mann, Janelle Monae Join Steve Carell in Robert Zemeckis' Next Film (EXCLUSIVE)". Variety. Retrieved July 7, 2017. ^ Kit, Borys (May 23, 2017). "'Baby Driver' Actress Eiza Gonzalez Joins Steve Carell in Robert Zemeckis Drama (Exclusive)". The Hollywood Reporter. Retrieved July 7, 2017. ^ Kit, Borys (June 16, 2017). "Diane Kruger Joins Steve Carell in Robert Zemeckis Drama (Exclusive)". The Hollywood Reporter. Retrieved June 17, 2017. ^ McNary, Dave (June 28, 2017). "Gwendoline Christie Joins Steve Carell in Robert Zemeckis' Drama". Variety. Retrieved June 28, 2017. ^ Sneider, Jeff (July 7, 2017). "Nurse Jackie Alum Merritt Wever Joins Steve Carell In Robert Zemeckis Next Movie". The Tracking Board. Retrieved July 7, 2017. ^ N'Duka, Amanda (July 31, 2017). "Universal's Untitled Robert Zemeckis Project Adds Neil Jackson". Deadline. Retrieved August 14, 2017. ^ Galuppo, Mia (August 6, 2017). "Robert Zemeckis' Universal Drama Casts a Villain". The Hollywood Reporter. Retrieved August 14, 2017. ^ The Deadline Team (August 21, 2017). "Leslie Zemeckis Joins Untitled Robert Zemeckis Project Based On Docu 'Marwencol'". Deadline. Retrieved August 22, 2017. ^ Topel, Fed (December 20, 2018). "Welcome to Marwen movie review: Toy story of terror". Monsters and Critics. Retrieved December 22, 2018. ^ Mirchandani, Amar (August 1, 2017). "21 Movies Filming in Vancouver This August - 604 Now". 604 Now. Retrieved August 14, 2017. ^ Mirchandani, Amar (August 4, 2017). "9+ Hollywood Stars You Can Catch Around Vancouver This August". 604 Now. Retrieved August 14, 2017. ^ Marc, Christopher (June 25, 2017). "Robert Zemeckis' Next Film Shoots August–October In Vancouver". Ome Gaunderground. Retrieved July 12, 2017. ^ McNary, Dave (13 June 2018). "Film News Roundup: Laverne Cox Boards 'Disclosure: Trans Lives on Screen' Documentary". Retrieved 2 October 2018. ^ Sharf, Zack (December 24, 2018). "'Welcome to Marwen' Is Universal's Second Christmas Box Office Bomb, Expected to Lose $50 Million". IndieWire. Retrieved December 24, 2018. ^ "Welcome to Marwen (2018)". Rotten Tomatoes. Fandango Media. Retrieved December 27, 2018. ^ "Welcome to Marwen reviews". Metacritic. Retrieved December 21, 2018. ^ David Ehrlich (December 19, 2018). "'Welcome to Marwen' Review: Robert Zemeckis Turns Outsider Art into Hollywood Product". IndieWire. Penske Business Media. Retrieved December 20, 2018. ^ Phillips, Michael (December 20, 2018). "'Welcome to Marwen' review: A hate crime sparks Steve Carell's fantasy world — and a seriously misjudged movie". Chicago Tribune. Retrieved December 19, 2018. ^ "'Welcome to Marwen': Uplifting story of a charming figure and his action figure".